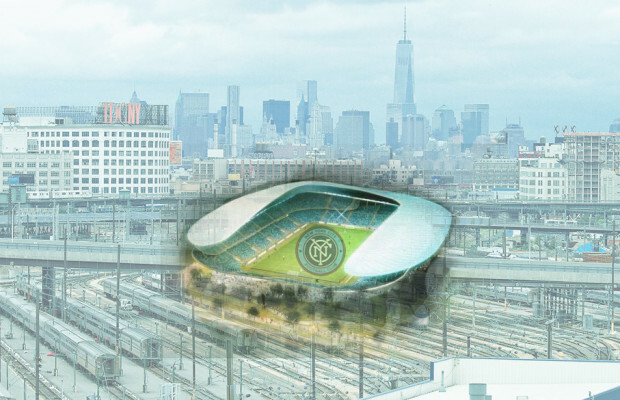 NYC is Blue: Empire of Soccer: "Sunnyside Yards: NYCFC’s Dream Stadium Location?" Empire of Soccer: "Sunnyside Yards: NYCFC’s Dream Stadium Location?" Empire of Soccer has a really interesting article up now, regarding a parcel of land that NYCFC should be looking at, as well as explaining why it almost certainly won't happen. Sunnyside Yards: NYCFC’s Dream Stadium Location? Since the franchise was first announced, fans and pundits have speculated on dozens of properties where a soccer-specific stadium for New York City FC could be built. Empire of Soccer listed 10 potential sites in 2013, and analyzed two additional sites in the Bronx and Westchester after that. As the calendar turns to 2016, the club is—at least publicly—no closer to a soccer-specific stadium than they were when the $100 million expansion fee check cleared in 2013. However, EoS has learned that city and state agencies are currently investigating the potential of developing a massive piece of land in Sunnyside, Queens — vast enough to fit new city parks, thousands of units of affordable housing, a new convention center, or, perhaps, a soccer-specific stadium. This piece of land is, in many ways, the “final frontier” of New York City’s real estate boom. In a city with shockingly few stadium-sized parcels of land available to build upon—this could become NYCFC’s last best shot of getting everything they want from a home field. The Sunnyside rail yards in Queens as they look today. The site in question is the Sunnyside Yards; a massive expanse of railroad tracks, train depots, and switches nestled between the neighborhoods of Sunnyside to the south and Long Island City to the north and west. It encompasses 192 acres and stretches from the mouth of the Long Island Railroad and Amtrak tunnels nearly halfway to the neighborhood of Woodside. It is one of, if not the largest, undeveloped pieces of land in the entire city and it has been coveted for years by city officials and developers alike. Sunnyside dwarfs similar NYC redevelopment projects where platforms were built above active rail yards, with large buildings later constructed atop those platforms. The West Side Yard near Penn Station was to be the site of the 2012 Olympic Stadium and later the home of the New York Jets before the proposal was defeated on the state level and the Olympics were awarded to London. A massive development project called Hudson Yards was approved and is now rising on that site. After years of community opposition and the use of eminent domain, the Vanderbilt Yard in Prospect Heights, Brooklyn was decked over and the Barclays Center—home of the Brooklyn Nets and now the New York Islanders—was built atop that platform. After years of delays, other residential and commercial structures are now atop other sections of the Vanderbilt rail yard. The Barclays Center and Hudson Yards developments have provided the city with case studies in what to do with the Sunnyside Yards. Both were met by massive community opposition, and both took more than a decade to come to fruition. Both were—at least from the start—centered around a sports facility as their anchor tenant. Both were also approved in the pre-recession real estate boom of the mid-aughts and both had several brushes with death before they got off the ground. The Sunnyside Yards could become just about anything, which is the site’s blessing and curse. The de Blasio administration, while championing a populist message, has been painfully impotent in imposing a meaningful affordable housing policy in a city festooned with cranes putting up luxury high-rise after luxury high-rise. Because Sunnyside is so big, and because there are so many power brokers at the table, there are dozens of proposals about what to do with the site. Mayor de Blasio unsurprisingly came out in favor of building affordable housing over the Sunnyside Yards, but others have called for constructing a brand new convention center to replace the Jacob Javits Center on Manhattan’s West Side. Local politicians have called for more open space and parks to be placed on the site. If a current study by New York State determines that decking over the Sunnyside Yards is feasible, then the location should become an incredibly attractive option not just for a NYCFC stadium for City Football Group, but also for Shiekh Mansour and his government’s investment arm, The Abu Dhabi Investment Authority. The ADIA, on which Mansour sits on the Board of Directors, has moved to diversify its holdings in the last decade, not solely relying on the fluctuations of the global energy market. They have invested heavily in sports teams, cultural institutions, and real estate around the world, especially in New York City. The price of oil goes up and down, but New York City real estate will always be a sound investment. City Football Group, in conjunction with the Abu Dhabi Investment Authority, could put together a master plan for Sunnyside similar to what the Riverbend Project tried to do in Harrison. They could use a NYCFC Stadium by itself, or in conjunction with a new Javits Center, to be the centerpiece of a massive mixed-use development. Unlike the Hudson Yards development on the far west side of Manhattan, Long Island City has never been hotter, and the transit options already exist in abundance. 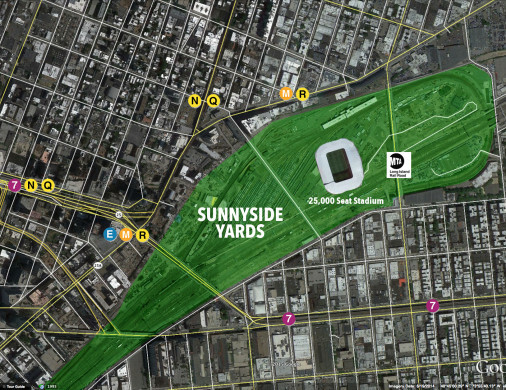 How a 25,000 seat stadium would fit in relation to Sunnyside Yards. Previous NYCFC stadium sites have all had their pros and cons, but on a conceptual level, Sunnyside Yards is a perfect 10. If placed between the Honeywell Avenue and 39th Street bridges, the stadium would be adjacent to six subway lines, a newly-built Long Island railroad stop in Sunnyside (part of the LIRR to Grand Central project), and the Long Island Expressway. The stadium would be within walking distance for fans in Long Island City and Astoria, and within a 20 minute train ride of Williamsburg, Greenpoint, and Bushwick, Brooklyn. Even with all the money in the world—which Abu Dhabi basically has—this is a project that is nearly impossible to pull off in the current climate of New York politics. The developers would need to get New York State (who owns the MTA’s Long Island Railroad), the State of New Jersey (whose NJ Transit trains are parked in the Sunnyside Yard before they return to Penn Station and back out to Jersey), and the Federal government (whose Amtrak trains are parked and travel through the train yard) to agree to sell the air rights above the train yard. Even if you miraculously get those three agencies on the same page, you’d have to also get the mayor and governor on the same page… and at this point Mike Petke and Ali Curtis are on better terms than Andrew Cuomo and Bill de Blasio. If you could get those two on the same page, you would have to hire the best engineers in the world to construct a 192 acre platform 20-30 feet above one of the world’s busiest railways without disrupting service…And that’s all before they’d actually build the stadium or the buildings around it! Even if a master plan was agreed to today, it would likely be 10 years before the first buildings went up, and NYCFC (or MLS for that matter) likely won’t have that kind of patience. Someday—someday sooner rather than later—a massive development is going to be built in the Sunnyside Yards. The forces building New York City bigger, taller, and richer will overcome the innumerate obstacles that stand in the way of the train yard being converted into a bustling city-within-a-city. The City and State of New York will not come knocking on NYCFC’s door with a soccer-specific stadium on a silver platter, no matter how many “historic inaugural season ticket holders” the club has. Major League Soccer picked this ownership group because they have the resources to go out and build both a team—and stadium—of grand proportions. Sunnyside Yards may be NYCFC’s best chance at fulfilling those grand ambitions. Interesting idea. I've long thought that Long Island City would be a great central location, and Sunnyside Yards is only blocks north of that. They could move that stadium to any number of places in the green, either the three large parcels north of the elevated subway tracks or even the small one directly south. I used to live in the neighborhood of Sunnyside (which, in one of those geographical quirks Queensis known for, is actually a couple neighborhoods over from Sunnyside Yards). 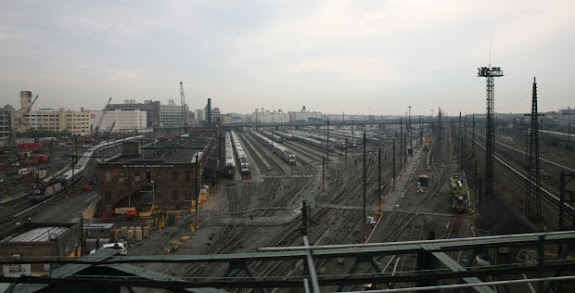 I would take the 7 train into work, and right before Queens Plaza was treated to an expansive view of the railyards. If I was thinking about development in the 1990s I can't believe somebody hasn't actually done it by now. Perhaps the various state parties make it just too complicated.